A hundred years ago today, T.S. Eliot wrote to his mother with his first impressions about the war that will become known as World War One. 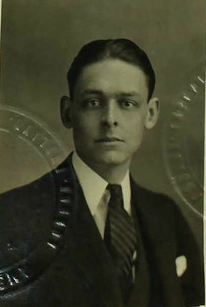 At the beginning of August 1914, Eliot was in Germany, attending a summer school in Marburg. Though he would later describe the experience of being caught in Germany as "much like the childhood's exasperation of being in an upper berth as the train passed through a large city - (...) an intolerable bore," his first letter to his family paints a slightly different picture. He captures the disbelief, confusion and rising tension as the international participants at the summer school suddenly find themselves thrust into the roles of friends or enemies to Germany, according to their nationality. I confess I did feel a little doubtful of the advisability of remaining in Germany a day or two before war was declared against Russia; but it never entered my head that England would declare war too: and we all supposed that after the mobilization, we could (as proved the case for those of us who were Americans) slip away without difficulty. Besides, I had come to Germany expressly. The summer school was just opened that day, and I did not want to lose my summer for a scare. It was not until evening (August 2) when the pupils assembled that I appreciated the seriousness of our position. We were told it would be impossible to leave for a fortnight; that it would be impossible for the summer course to continue; but that to fill our time during the enforced stay various makeshift courses and conversation groups would be arranged. The director made a speech in which he cautioned us to be very careful, to avoid crowds, and not to talk in foreign languages in the street. By this time he had got us pretty well frightened of course, and no one was taking very keen interest in the proposed courses. The Russians, who knew they wouldn't get out anyway, were miserable and silent; there appeared to be only one Frenchman, the professor, who was also miserable; the English and Americans were talkative and excited. I have a great deal of confidence in the ultimate event; I am anxious that Germany should be beaten; but I think it is silly to hold up one's hands at German 'atrocities' and 'violations of neutrality'. The Germans are perfectly justified in violating Belgium - they are fighting for their existence - but the English are more than justified in turning to defend a treaty. But the Germans are bad diplomats. It is not against German 'crimes', but against German 'civilisation' - all this system of officers and professors - that I protest. But very useful to the world if kept in place. I cannot but wonder whether it all seems as awful at your distance as it does here. I doubt it. No war ever seemed so real to me as this: of course I have been to some of the towns about which they have been fighting; and I know that men I have known, including one of my best friends*, must be fighting each other. So it's hard for me to write interestingly about the war. * Probably Jean Verdenal, Eliot's friend from Paris who died in 1915 and to whom Prufrock is dedicated. That's a really interesting bit about Eliot. Those types of moral dilemmas are what make war so awful, but interesting to read about as they challenge your own moral codes.